(Phys.org) —Colorful, see-through solar cells invented at the University of Michigan could one day be used to make stained-glass windows, decorations and even shades that turn the sun's energy into electricity. The cells, believed to be the first semi-transparent, colored photovoltaics, have the potential to vastly broaden the use of the energy source, says Jay Guo, a professor of electrical engineering and computer science, mechanical engineering, and macromolecular science and engineering at U-M. Guo is lead author of a paper about the work newly published online in Scientific Reports. "I think this offers a very different way of utilizing solar technology rather than concentrating it in a small area," he said. "Today, solar panels are black and the only place you can put them on a building is the rooftop. And the rooftop of a typical high-rise is so tiny. "We think we can make solar panels more beautiful—any color a designer wants. And we can vastly deploy these panels, even indoors." Guo envisions them on the sides of buildings, as energy-harvesting billboards and as window shades—a thin layer on homes and cities. Such an approach, he says, could be especially attractive in densely populated cities. 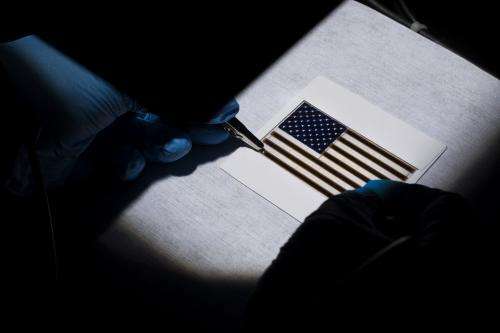 In a palm-sized American flag slide, the team demonstrated the technology. "All the red stripes, the blue background and so on—they are all working solar cells," Guo said. The Stars and Stripes achieved 2 percent efficiency. A meter-square panel could generate enough electricity to power fluorescent light bulbs and small electronic gadgets, Guo says. State-of-the art organic cells in research labs are roughly 10 percent efficient. The researchers are working to improve their numbers with new materials, but there will always be a tradeoff between beauty and utility in this case. Traditional black solar cells absorb all wavelengths of visible light. Guo's cells are designed to transmit, or—in other versions—reflect certain colors, so by nature they're kicking energy from those wavelengths back out to our eyes rather than converting it to electricity. Unlike other color solar cells, Guo's don't rely on dyes or microstructures that can blur the image behind them. The cells are mechanically structured to transmit certain light wavelengths. To get different colors, they varied the thickness of the semiconductor layer of amorphous silicon in the cells. The blue regions are six nanometers thick while the red is 31 (the team also made green, but that color isn't in the flag). Amorphous silicon is commonly used in screens on cell phones, laptops and large LCD screens, in addition to solar cells. They sandwiched an ultrathin sheet of it between two semi-transparent electrodes that could let light in and also carry away the electrical current. One of these so-called charge transport layers is made of an organic material. This hybrid structure, a combination of both organic and inorganic components, lets the researchers make cells that are 10 times thinner than traditional amorphous silicon solar cells. The organic layer replaces a thick 'doped' region that would typically controls the flow of electricity. The ultrathin, hybrid design helps the cells hold their color and leads to a nearly 100 percent quantum efficiency. Quantum efficiency is different from overall efficiency. It refers to the percentage of light particles the device catches that lead to electrical current in that charge transport layer. Solar cells can leak current after this point, but researchers strive for a high number. The cells' hues don't change based on viewing angle, which is important for several reasons. It means manufacturers could lock in color for precise pictures or patterns. It's also a sign that the devices are soaking up the same amount of light regardless of where the sun is in the sky. Conventional solar panels pivot across the day to track rays. "Solar energy is essentially inexhaustible, and it's the only energy source that can sustain us long-term," Guo said. "We have to figure out how to use as much of it as we can."